One of the reasons why new year’s resolution fail is because many set goals that are impossible to achieve. It’s hard to go from a couch potato to a fitness fanatic overnight. Here are some simple tweaks the average person should make to start their fitness journey. As the new year approaches, many people choose to be healthier and fitter than the year prior. But, most of them give up and choose to live a sedentary lifestyle. One of the reasons why their new year’s resolution fail is because they set goals that are impossible to achieve. It’s hard to go from a couch potato to a fitness fanatic overnight. Here are some simple tweaks the average person should make to start their fitness journey. While driving to and from places has its share of benefits, you can get to many places on a bicycle. There are plenty of benefits of choosing to a ride a bicycle rather than driving. That doesn’t mean you should cycle across the country to visit your family in January. Choose to use your bicycle for small trips to the office or the grocery store. Cycling isn’t just for kids. Adults can enjoy getting a workout. Driving in a vehicle may get you to your destination faster, but your body is just sitting there. It’s important to get as much as exercise as you can throughout the day. Cycling regularly burns calories, lowers blood pressure levels and reduces your chance of getting diabetes, and other diseases. Yoga isn’t just for relaxation. This popular form of exercise promotes increased flexibility, weight reduction, and cardio and circulatory health. For many people, a regular yoga practice may be a hard thing to get started on. Yoga is a great option for those with kids or those who have busy lifestyles. The great thing about yoga is that you can do it just about anywhere. Choose a comfortable spot in your home to devote some time to your yoga practice even if it’s 10 minutes a day. If you have a spare room to practice yoga, then great. If not, you can practice in your office, bedroom, or living room. All you need is a yoga mat to start. Blocks and bolsters are ideal to have, but you can use pillows and blankets instead. You can follow along with an online class, DVD program, or free video tutorials. The beauty about yoga is that you can decide which yoga sequence you want to try. There’s no one perfect class. You have to make it perfect by choosing the sequences that will benefit you the most. Bodyweight exercises are a great way to increase muscle strength and lose weight. These exercises can be done anywhere in your home with no equipment, and there are many exercises to do. To start, do push-ups and squats every morning and night. These light exercises can start and finish your day on a positive note. 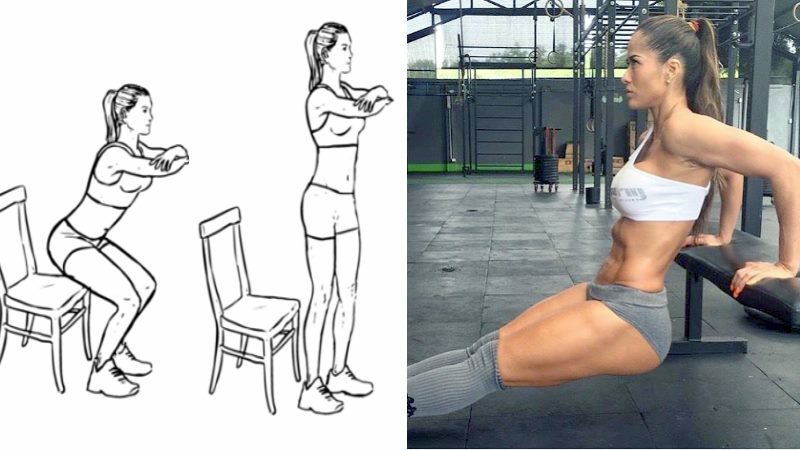 The great thing about these exercises is that they require no weights and improve your upper and lower-body strength. Start slowly with 10 repetitions twice daily, and increase as your strength increases. There are fitness deals on workout programs and apps that guide you through the process of working out at home. If you decide you want to take this to the next level, eventually you can consider investing in a home gym, but for starters, stick to the basics. Food delivery services make it too easy to get dinner at your door. For each food service delivery you replace with a home-cooked meal, you can save up to 200 calories. Take one day out of your week to plan your meals ahead of time and keep fresh ingredients on hand. The more you get used to cooking, the more you’ll become equipped at creating your own dishes. Not sure how to get started? There are plenty of meal planning apps at your fingertips. Most of these meal planning tools include customized meal plans that are based on your calorie intake and weight-loss goals. It’ll only recommend the foods you love to eat. In a hurry? Some of the best tasting protein powders are like a meal within itself. They’ll keep you full a good part of the day. Just add them to your morning smoothie or yogurt. If you’re too tired to a few times a week, there are some chair workouts you can practice while you’re stuck at work. Just 10 minutes of exercise each day will help you stay active and fit. These chair exercises will prevent aches and pains that occur from sitting too long. Stretching exercises combined with push-ups is a great way to help you stay active. Some examples of exercises you can do at your desk include chair squats, chair or desk dips, and press-ups. If you can get out of the house, go for a 30-minute walk or jog. Not only will it clear your head from work obligations, but it’ll also raise your heart rate and burn calories. Sadly, most people aren’t getting enough water these days. Not only does water keep you hydrated, but it prevents you from snacking throughout the day. Sometimes people think they’re hungry when they’re actually thirsty. Drink at least half of your body weight in ounces each day. Individuals who drank two to three cups of water before meals lost three pounds than those who didn’t, according to a 2015 study in the journal “Obesity.” Since water fills your stomach, it makes you eat less at your meals. Swap out those vending machine snacks for bottled water instead. Add colorful fruits and vegetables to each of your meals. This will help combat free radicals and boost your levels of antioxidants and nutrients. Eating a salad 30 minutes before your meal can crush cravings and help you achieve your weight loss goals even faster. Don’t be afraid to eat the colors of the rainbow. The color of a fruit or vegetable is indicated by how much nutrients it contains. Eat a wide variety of fruits and vegetables to make sure you’re having a well-balanced diet. These fruits and vegetables provide more nutrients and vitamins, which improves your overall health and well-being. You don’t have to go through an extreme diet to lose weight. It’s often easier to make some subtle changes to your diet and lifestyle. These small changes will go a long way when it comes to achieving your weight loss goals.